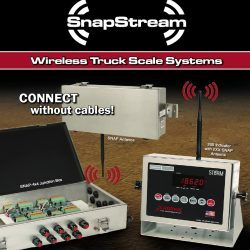 Cardinal Scale Manufacturing SnapStream is a fully-integrated NTEP legal-for-trade wireless scale system for commercial applications. It’s completely proprietary to Cardinal Scale and offers a number of competitive advantages for new or pre-existing scale installations. SnapStream allows a scale to send weight data wirelessly to an indicator and the indicator in turn to send that data wirelessly to a host of peripheral equipment such as remote displays, printers, PC’s and networks. SnapStream is a digitally-controlled weighing and diagnostic system designed utilizing 802.15.4 Zigbee protocol for reliable and accurate weight and data transmission. SnapStream may be used with Cardinal Scale Manufacturing model 205, 210, and 225 weight indicators, where scale diagnostics can be viewed directly on the indicator.